Volledig ingerichte luxueuze privévilla met een afgezonderd privézwembad, in het hart van Coral Bay. Gelegen in een rustige doodlopende straat zonder doorgaand verkeer, minuten lopen naar de belangrijkste strook met bruisende taverna's, bars en supermarkt, en een korte wandeling naar de bekroonde beroemde stranden met blauwe vlag. Volledig uitgerust om zijn tweede huis te weerspiegelen van de eigenaars die enkele maanden buiten het seizoen in de villa verblijven. Grote beschutte tuin, zwembad met Romeinse treden voor gemakkelijke toegang of gewoon lekker luieren. Uitgebreide schaduwrijke terrassen met externe lounge en eethoek, BBQ, overdekte tafeltennistafel. Overdekte parkeergelegenheid op privérit, zodat uw auto koel blijft. 3 tweepersoonsbedden met een eigen badkamer en een bad op de begane grond. Aparte garderobe naar de begane grond. Gedeeld balkon met uitzicht op het zwembad tot 2 slaapkamers, plus een eigen balkon tot master suite. Begane grond slaapkamer openslaande deuren naar zithoek / tuin, op niveau toegang tot de drive / Street. Nieuw ingerichte keuken met prachtige granieten werkbladen en spoelbak, inductiekookplaat. Lederen sofa's voor 6+, 50 inch tv, met BOSE soundbar met Bluetooth voor aansluiting op uw muziek, internettoegang voor Britse en internationale programma's. Houtkachel voor de winter. Bose CD-radio-speler, 4 USB-oplaadpunten. Kinderstoel en kinderbedje aanwezig. Kinderen zijn dol op de villa en het zwembad. Standard weerspiegelt het tweede huis van de eigenaar dat ze verschillende maanden in elk jaar doorbrengen en voortdurend verbeteren en bijwerken. Wonderful villa, clean, spacious, all amenities provided and good working order. On our next trip to Coral Bay we will have no hesitation in booking this wonderful villa again. It is spacious, clean and every utility you wish for is provided and in impeccable condition. Our family really loved the pool and the table tennis on the property which is enclosed with a pretty garden for privacy. The location is great and is near but not too close to the main strip for the restaurants and bars. I also have to mention the agents, we needed some help with a couple of things and they were amazingly prompt and helpful - a wonderful team. And thanks to John for letting us stay in his beautiful villa. 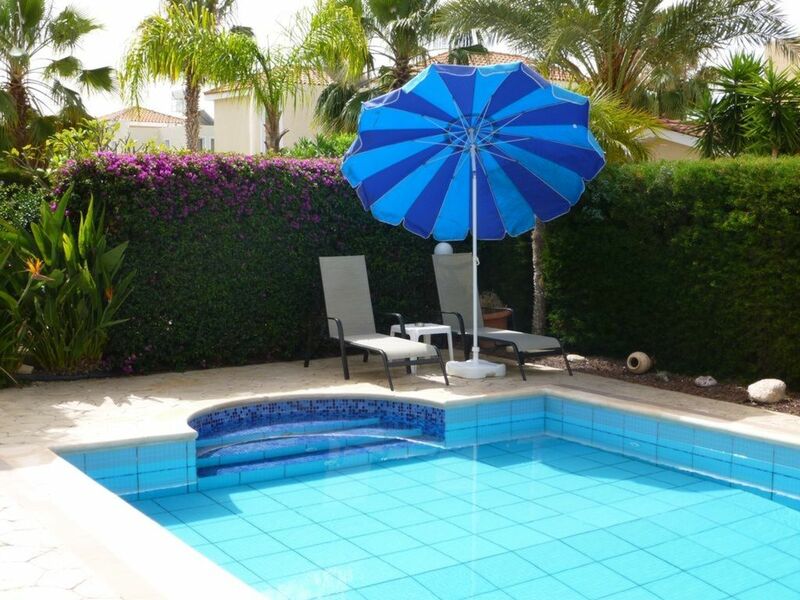 Lovely villa in a great location in Coral Bay, lots of space inside and out for a family. We stayed out of season (March) and it was good to have heating during the evenings. My wife and I took our 3 daughters to Coral Bay for the first time and had a lovely time , What made it extra special was this beautiful villa we stayed in . Modern, spacious and clean with everything you need for a great holiday, a real home from home . The bedrooms were very comfortable with en suite, relaxing living room and modern kitchen. The pool and outside areas are immaculate with the pool being the icing on the cake . I couldn’t recommend this property enough , it’s walking distance to some amazing restaurants and the bars and beach are also close by. John the owner was extremely helpful from start to finish , we can’t wait to return again very soon . Thank you so much for your lovely review, we are delighted you had a great time and liked our villa so much, we would be so delighted if you come back. Beautiful villa in an excellent location. Central and convenient location close to all amenities, including the beach, restaurants shops and local transport. Beautifully maintained villa in private road, within easy walking distance to all of the above. Would highly recommend and would certainly hope to return myself. Thank you vsry much we are so delighted you were happy, we have just got back here ourselves and hope you will soon. Great location ,spacious villa in queens paradise. Have stayed in this villa 4 times and at various others in the area for 12 years now , this is our favourite overall. Pool lovely as is outside area, garden kept nice. All in all fantastic villa. Booking for next year soon . Thanks for this, we are delighted you came back and hope you do return. Our agents will replace the bread knife which seems to have gone AWOL. We plan to refurbish the master suite bathroom, this winter, having replaced a number of taps, and the sink and tap in the cloakroom last year, when the kitchen was refitted. The villa was perfect great location with everything you needed in walking distance only 5 minute walk from the main coral bay strip . The villa was clean and modern and had everything you needed to enjoy your stay . The pool was cleaned twice a week which was great . Whilst we were there a couple of lightbulbs went in the ensuite and it was sorted within the hour which was perfect nothing was too much trouble! Would definitely go back to this property it’s perfect!! Thanks so much, we are delighted we are achieving the level of guest satisfaction we strive for!